To Cite: Guo P, Yu H, Wang Y, Xie X, Chen G. Exosome: An Emerging Participant in the Development of Liver Disease, Hepat Mon. 2017 ; 17(8):e58021. doi: 10.5812/hepatmon.58021. Context: An exosome is a type of extracellular vesicle with a diameter of 30 - 100 nm and a density of 1.13 - 1.19 g/m. Exosomes exist in almost all body fluids and can be secreted and absorbed by most cells. They deliver information and molecules that participate in intracellular communication, thus contributing to the progression of various diseases, such as liver diseases. Evidence Acquisition: In this study we collected and summarized the most important and new data available on the role of exosome in liver diseases by the PubMed search. The study data were collected through searching the related keywords then classified and summarized. Results: In this review, we summarize the research findings regarding the roles of exosomes in liver physiology and pathology, mainly focusing on liver diseases such as viral hepatitis, liver cancer (mostly hepatocellular carcinoma [HCC]), and liver injury caused by other pathogenic factors (alcohol, drugs, hepatotoxins, high-fat diets, parasites, etc.). Conclusions: These studies revealed the involvement of exosomes in various aspects of liver physiology and pathology and in the progress of liver diseases. More importantly, it offers a promising new direction for disease diagnosis and treatment. Exosomes can act as natural shuttles to deliver bioactive molecules that alter the behavior of the recipient cells, offering a new means of cell-cell communication in physiological and pathological processes in tissues or organs. Thus, exosomes and their contents may be used as novel potential biological markers for disease diagnosis and prognosis, as a vehicle for drug intervention and RNA interference therapy, or as a potential target for clinical treatment. For instance, exosomes play a functional role in myocardial remodeling (1), Alzheimer disease (AD) (2), breast cancer (3, 4), and other cancers (5-7). Exosomes are extracellular vesicles of the endocytic origin with a lipid-bilayer membrane (8). Johnstone et al. discovered the small vesicles of endosomal origin that are released during reticulocyte differentiation and named “exosomes” (9). At present, exosomes are defined according to certain characteristic criteria, including a size between 30 and 100 nm (10, 11), a density of 1.13 - 1.19 g/mL (6, 12), specific morphological features (i.e., a cup- or dish-shaped morphology when observed with transmission electron microscopy (6), or a round shape when observed with cryo-electron microscopy (8, 11), and having general characteristic protein components (CD63 and TGS101). Exosomes carry a variety of contents, including various proteins, DNA, mRNA, microRNA (miRNA), long non-coding RNA (lncRNA), and even viruses. According to the ExoCarta database (http://www.exocarta.org/), the presence of 41,860 proteins, more than 7540 RNA molecules and 1116 lipid molecules has been confirmed in exosomes in more than 286 studies (13). In the human body, exosomes have been isolated from various bodily fluids. They can be secreted and ingested by a wide variety of cells (8, 14). After the exosomes arrive at their destination, the information is transmitted from the exosomes to the recipient cells in 1 of 3 ways: 1) through a ligand-receptor interaction on the cell membrane surface (15); 2) through the fusion of the exosome membrane with the recipient cell membrane (16); and 3) through an internalization of exosomes via cellular endocytosis (17) (Figure 1). 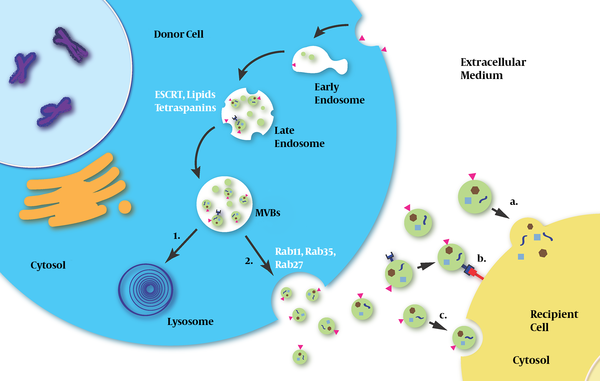 Exosomes are released by the donor cells and then captured by the recipient cells. Initially, early endosomes are produced by cellular endocytosis and develop into late endosome; subsequently, small vesicles, which are called intraluminal vesicles (ILVs), are generated by inward budding from the limiting membrane of endocytic vesicles (both early and late exosomes); and finally, ILVs develop into multivesicular bodies (MVBs). This process involves ESCRT, lipids, tetraspanins, etc. MVBs can either fuse with lysosomes for degradation or fuse with plasma membranes and release ILVs into the extracellular milieu. Rab proteins (Rab11, RAB35 and Rab27) are involved in the fusion of MVBs with the plasma membrane and the release of exosomes. After exosomes arrive at recipient cells, they exert a message-delivering function in one of three ways: a) through fusion with the plasma membrane; b) through ligand-receptor interaction; and c) via an endocytosis-dependent pathway. In the complex environment of the liver, various types of cells, including hepatocytes, cholangiocytes, HSCs, LSECs, natural killer T cells (NKT), Kuffer cells, and adult liver stem cells can either release or receive exosomes in cell-cell communication (18). Due to their newly discovered functions in inter-cellular information exchange, exosomes play an important role in liver physiology and pathology (Figure 2). Figure 2. Exosomes Play a Role in Liver Diseases. During physiological and pathological liver processes, exosomes from different sources have different functions, such as inhibiting cholangiocyte proliferation, promoting the proliferation of liver cells, activating HSCs or inhibiting the activated HSCs, and participating in liver fibrosis. In addition, exosomes can alter gene expression in LSECs and participate in liver cirrhosis. In viral hepatitis, exosomes are involved in the transmission of hepatitis viruses between cells; in addition, viral RNA-carrying exosomes participate in the regulation of immune responses. In liver cancer, tumor-derived exosomes are associated with tumorigenesis, tumor progression, invasion, angiogenesis, and drug resistance through various pathways, such as stimulating the anti-tumor response of NK cells. In other liver diseases (e.g., alcoholic liver disease or alcoholic hepatitis, drug-induced liver injury, non-alcoholic fatty liver disease or non-alcoholic steatohepatitis and primary biliary cirrhosis, exosomes can mediate pro-inflammatory responses and cause liver injury; however, mesenchymal stem cell (MSC)-derived exosomes can protect liver cells from hepatotoxicity. In parasitic liver disease, exosomes participate in adjusting the living conditions of parasites to facilitate their survival. In this study we collected and summarized the most important and new data available on the role of exosome in liver diseases by the PubMed search. The study data were collected through searching the related keywords: exosome, liver, liver disease, liver cancer, hepatocellular carcinoma, HCC, cholangiocarcinoma, CCA, hepatitis, hepatitis C virus, HCV, hepatitis B virus, HBV, alcoholic hepatitis, AH, non-alcoholic steatohepatitis, NASH, non-alcohol fatty liver disease, and NAFLD. Most of the cells in the liver have the capability to release and receive exosomes. For example, mouse hepatocytes can secrete exosomes that contain the cytochrome P450, UDP-glucuronosyltransferases (UDPGT), and glutathione S-transferases; in humans, these exosomes may exist in the plasma and play a role in extra-hepatic detoxification (19). Exosomes derived from rat bile can suppress the proliferation of cholangiocytes by inhibiting the ERK signaling pathway and increasing the expression of miR-15a (20). Prostaglandin E2-carrying exosomes from intestinal epithelial cells can inhibit the activation of liver NKT cells via α-GalCer and weaken the inflammatory response-induced liver injury (21). Exosomes and their content also contribute to liver regeneration. Hiroyuki et al. discovered that exosomes derived from hepatocytes can promote the proliferation and regeneration of liver tissue both in vitro and in mice models of liver ischemia/reperfusion injury or partial hepatectomy (22). The researchers believed that the underlying mechanism involves sphingosine 1-phosphate (S1P). Hepatocyte-derived exosomes carrying neutral ceramidase and sphingosine kinase 2 (SK2) are captured by adjacent hepatocytes and raise the intracellular level of sphingosine-1-phosphate, thus promoting hepatocyte proliferation (22). Hepatic fibrosis is a vital stage in the process of liver pathology and is commonly present in various chronic liver diseases. Patients with advanced hepatic fibrosis often require liver transplantation. Pathogenesis of the liver involves various types of liver cells; of these, HSCs are the key link in the occurrence and development of hepatic fibrosis. LSEC-derived exosomes containing sphingosine kinase 1 (SK1) can adhere to and then enter HSCs after binding to HSCs through the fibronectin/α5β1-integrin complex; afterwards, the exosomes result in an enhanced migration ability of target HSCs via the SK1/S1P pathway, thus participating in liver fibrosis (17). Moreover, simultaneous, with the above-described process, the activated HSCs can secrete exosomes that carry a high level of a connective tissue growth factor (CCN2), which in turn augments the fibrosis signal and activates more HSCs to accelerate the liver fibrosis process through interaction with other components (23). 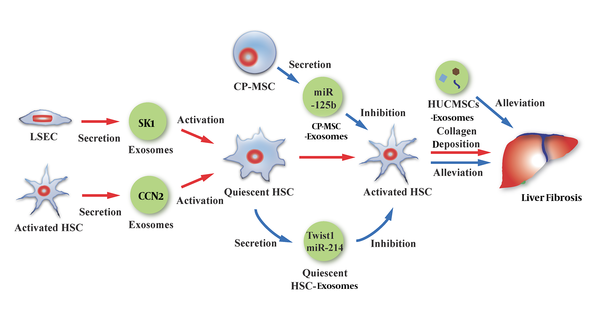 In contrast, quiescent HSCs can release exosomes that deliver Twist1 (a 21-kDa bHLH transcription factor) (24) and miR-214 (25) to activated HSCs. Twist1 can bind to DNM3os (noncoding dynamin 3 opposite strand transcript) E-box and promote miR-214 expression. miR-214 not only directly binds to CCN2 mRNA 3’ -UTR and inhibits its activity, it also suppresses the expression of CCN2 downstream molecules such as alpha smooth muscle actin and collagen. As a result, the function of the activated HSCs in liver fibrosis is inhibited (24, 25). This might be a new mechanism underlying signal controlling in liver fibrosis (Figure 3). HSC plays an important role in the process of hepatic fibrosis. On the one hand, LSEC exosomes or activated HSC exosomes can participate in liver fibrosis by activating quiescent HSCs. On the other hand, quiescent HSC exosomes or CP-MSC exosomes can alleviate liver fibrosis by inhibiting the activity of activated HSCs. In addition, HUCMSCs exosomes contribute to the suppression of liver fibrosis. Moreover, hepatic fibrosis is subject to the effects of exosomes derived from extra-hepatic cells. Exosomes secreted from human umbilical mesenchymal stem cells (HUCMSCs) can inhibit epithelial-tomesenchymal transition and decrease type I and II collagen deposition, thus alleviating CCl4-induced mouse liver fibrosis (26). miR-125b-carrying exosomes released from chorionic plate-derived mesenchymal stem cells (CP-MSCs) can reach the activated HSCs and inhibit the expression of Smo and other target genes to block the Hedgehog signaling pathway, which is also a contributor to liver fibrosis, thus ultimately alleviating liver fibrosis (27) (Figure 3). Myofibroblastic hepatic stellate cells and cholangiocytes treated with platelet-derived growth factor can secret exosomes that carry bioactive Hedgehog ligands. The same type of exosomes is also found in the plasma and bile of mice with ligated bile ducts. The ingested exosomes in LSEC can alter the expression of related genes in cells and participate in the pathological process of liver cirrhosis caused by biliary obstruction (28). Although the role of exosomes in physiological and pathological changes in the liver is still not entirely clear, these reports suggest that various exosomes have an unneglectable role. Furthermore, utilization of a particular substance or exosomes from specific origins to alter hepatic pathology might be a feasible treatment method to slow down the progression of liver fibrosis and cirrhosis. The hepatitis C virus (HCV) is a single-strand RNA virus that causes acute and chronic hepatitis. Patients with long-term HCV infections develop a variety of complications, including liver fibrosis, cirrhosis, and even HCC. Previous research has confirmed the presence of viral RNA in the plasma exosomes of patients with HCV infection (29), although, no sufficient evidence has proven the role of exosomes in mediating infection. However, a series of recent studies revealed that exosomes derived from the HCV-infected Huh7.5 cells and plasma of HCV-infected patients contained full-length viral RNA, viral protein or virus particles, which allowed the exosomes to infect adjacent cells effectively (30-34). Cells containing HCV subgenomic replicon (SGR), which lack viral structural protein and cannot produce virus particles are able to release exosomes carrying subgenomic HCV RNA; subsequently, the exosomes are ingested by target cells leading to viral replication in the cells (31, 32). This indicates a viral particle-independent pathway for HCV transmission. In addition, the relationship between HCV RNA-carrying exosomes and the human immune system has been gradually clarified. For instance, HCV-infected hepatocytes can release exosomes packaged with full-length viral RNA (35, 36) or HCV-SGR (37), which are then transported to and activate plasmacytoid dendritic cells (pDCs), ultimately triggering interferon production. HCV-RNA exosomes secreted from hepatocytes with HCV or HCV-SGR infection can stimulate the production of galectin-9 in monocytes (38). The increase in galectin-9 may be related to the suppression of the autoimmune response, which in turn causes the HCV infection to be persistent (38). In summary, it is very likely that HCV RNA-containing exosomes contribute to the HCV propagation as well as infection in the host and are related to the innate immune response induced by HCV. Moreover, it is speculated that these exosomes are involved in the pathological processes of HCV-induced chronic hepatitis and the resulting cirrhosis as well as HCC. In the extracellular environment, exosomes act as not only a vehicle but also a space that protects the HCV viral particles or viral RNA. Exosomes can protect HCV RNA from being broken down by extracellular RNase. Moreover, they provide an additional pathway for viruses or viral RNA to enter cells. This pathway is independent from CD81, scavenger receptor type1, apolipoprotein E receptor, and HCV E1/E2 proteins (viral structural proteins), resulting in the poor efficacy of immunotherapy for HCV treatment (34). Researchers have found that miR-122, HSP90, and Ago2 complex in exosomes can enhance HCV replication, suggesting that the utilization of miR-122 and HSP90 inhibitors can inhibit exosome-mediated HCV infection (34). In addition, the same research group discovered that proton pump inhibitors or bafilomycin A1 (vacuolar-type H+-ATPase inhibitor) can change intracellular pH and damage the endocytic function of the cells, thus suppressing exosome-mediated HCV infection (34). Shrivastava et al. confirmed that the inhibition of autophagy of HCV-infected hepatocytes can result in an intracellular accumulation of HCV proteins and nucleic acids resulting from a reduced exosome-mediated HCV release (39). Exosomes derived from type I/III type interferon (IFN)-treated SEC cell line TMNK-1 cells can inhibit HCV replication in infected Huh7.5 cells, which may be attributed to an upregulation of antiviral gene expression (40). In the study of Li et al. IFN-α-induced liver non-parenchymal cells (LNPCs) released exosomes containing antiviral molecules, which led to the suppression of HCV replication (41). Pan et al. used exosomes as a CD81 siRNA carrier to suppress CD81 expression, providing a potential exosome-related RNA interference therapy for HCV (42). All of these studies shed some light on new therapeutic strategies for blocking HCV transmission. HBV infection can significantly change the protein content of the exosomes from Huh-7 cells, e.g., the elevated level of valosin-containing protein (VCP, transitional endoplasmic reticulum ATPase). Due to the fact that the VCP increase in the liver is associated with the postoperative recurrence of HCC, it is speculated that alterations of the VCP level might be related to HBV-induced HCC (43). Li et al. revealed that IFN-α-induced LNPCs (e.g., macrophages and LSECs) can secrete antiviral molecules such as APOBEC3G (a cellular cytidine deaminase), certain types of mRNA (IFITM1 and GTPBP2), and miRNA (miR-638, miR-4284, and miR-1260) to hepatocytes as well as suppress the replication of HBV, using exosomes as carriers. Moreover, after ingesting the exosomes, the recipient HBV-infected hepatocytes return to an antiviral state (41). Some evidences also suggest that exosomes might contribute to immune neutralization escape of other types of hepatitis viruses. HAV, a non-enveloped virus, has been found in extracellular exosome-like vesicles and can evade the body’s immune system and enter the cells (44). In in vitro experiments, HGV (human pegivirus, HPgV) RNA-containing exosome-like vesicles are positive for exosomal marker protein CD63 and can deliver viral RNA to peripheral blood mononuclear cells (PBMCs), where HGV RNA can replicate (45). In various liver injury models induced by alcohol, drug, inflammation, or diet, the changes in the protein contents as well as mRNA levels/types in the exosomes have been proven to be satisfactory indicators for evaluating inflammation and promising biomarkers for detecting liver injury (46-53). An earlier study reported that the serum exosomes contained higher levels of miR-122 and miR-155 in mice with alcohol- or Toll-like receptor (TLR) 9 ligand (CpG motif, cytidine-phosphate-guanosine)/TLR4 ligand (LPS, lipopolysaccharide)-induced liver injury (46). Momen-Heravi et al. found that the exosome level and the miR-192, miR-30a, and miR-122 levels in exosomes were significantly higher in the circulation system of alcohol-fed mice and alcoholic hepatitis (AH) patients, with the miR-192 level showing the greatest increase (47). Similarly, a significant elevation of the miR-122 level was reported in another study of alcohol-treated mice, healthy alcoholic individuals, alcohol-treated Huh7.5 cells, and primary liver cells (48). In the AH patients, the remarkably increased number of exosomes in their circulation system is comprised mostly of exosomes derived from alcohol-exposed monocytes, which contain a significantly elevated level of miR-27a. The exosomal miR-27a can stimulate naïve monocytes to differentiate into M2 macrophages, increase the secretion of IL-10, and transforming growth factor β, thus enhancing the phagocytic capacity (49). Recently, Vikas et al. found that alcohol-exposed hepatocytes can release CD40 ligand (CD40L, a member of the tumor necrosis factor protein family) containing extracellular vesicles or exosomes via a caspase dependent pathway, however, not dependent of apoptosis, which activate macrophage and promote it to produce pro-inflammatory factors, responsible for inflammation in alcoholic liver disease (54). In an in vitro experiment using monocytic THP1 cells, the miR-122 in the exosomes derived from alcohol-treated hepatocytes acted on the related targets on the THP1 cells and induced a pro-inflammatory response (48). In mouse models of liver injury induced by acetaminophen (APAP) and D-galactosamine, the liver-specific mRNA level in the serum exosomes increased (55). Bala et al. found that miR-122 increased and miR-155 slightly decreased in the exosomes in an APAP-induced liver injury model (46). Likewise, hepatocyte-derived exosomes showed significantly increased levels of liver-specific RNAs albumin and miR-122 to sub-toxic APAP exposure in an early step of liver injury, researchers who maintained these exosomes may be associated to early immune responses in the formation of drug-induced liver injury (56). In in vitro experiments, significant protein changes were observed in exosomes secreted by hepatotoxicant-treated hepatocytes and similar changes were also detected in the serum exosomes in a rat model of liver injury induced by galactosamine, e.g., the levels of carboxylesterase (CES) protein family members and CES3 significantly increased (51). The injection of the exosomes derived from the peripheral blood of mice that were fed a high-fat diet resulted in an accumulation of immature myeloid cells (CD11b + Ly6C + Ly6C−cells) in the liver of the recipient mice, which might be responsible for obesity-related liver disease (57). In a diet-induced non-alcoholic steatohepatitis mouse model (in which the mice were fed a methionine-choline-deficient diet), the injured liver cells released miR-122 into the circulatory system via exosomes and thus decreased the miR-122 level in the liver (53). Despite the involvement of exosomes in liver injury, exosomes with specific origins might contribute to the alleviation of liver cell injury, thus protecting the liver. For example, in in vitro studies, exosomes have been used as vehicles for RNA interference to inhibit the miR-122-mediated pro-inflammatory response of macrophages (48). MSC-derived exosomes can improve the abilities of liver cells to resist drug-induced injury and apoptosis and promote cell proliferation and tissue regeneration (58). Such exosomes can stimulate the expression of related genes and proliferative proteins (such as proliferating cell nuclear antigen and cyclin D1) in hepatocytes, thus promoting cell cycle progression and increasing cell proliferation. For APAP- or H2O2-induced liver injury, MSC-derived exosomes can upregulate the expression of Bcl-xL protein to suppress toxicant-induced apoptosis (58). The role of exosomes in many tumors has been explored as the unique structural and functional features of exosomes have drawn increased attention from researchers. A recent study done by Hoshino et al. verified the “seed-and-soil” theory of cancer occurrence and progression proposed by the British physician Stephen Pagent. Hoshino et al. believed that exosomes might act as “seeds” for tumor metastasis. Moreover, they stated that the ability to target tumor metastasis may be associated with a specific integrin family in exosomes (59). In the study done by Kogure et al. the transfer of some miRNAs into HepG2 through an uptake of Hep3B-derived exosomes resulted in the suppression of transforming growth factor β activated kinase-1 (TAK1), and this loss of TAK1 activity was believed to be associated with hepatocarcinogenesis (60). In another recent report, exosomes derived from HCC cell line SMMC-7721 cells can in turn promote the growth and proliferation, metastasis, and invasion of the cells themselves (61). In addition, the exosomes released from highly migratable HCC cell lines (HKCI-C3, HKCI-8 and MHCC97L) carry an abundant amount of protumorigenic RNA and proteins, including MET protooncogene, S100 family members (S100A4, S100A10, and S100A11), and caveolins (CAV-1 and CAV-2), which increase the production of active matrix metalloproteinases (MMP)-2 as well as MMP-9 by activating the PI13K/AKT and MAPK signaling pathways, thus significantly enhancing the ability of non-motile hepatocyte cell line to migrate and invade (62). Similar studies were also conducted for other liver tumors. For example, for cholangiocarcinoma (CCA), an in vitro study revealed that the exosomes from CCA cell line KKU-M213 cells carry oncogenic proteins that increase the migration and invasion of the normal biliary epithelial H69 cells (63). HepG2-derived exosomes contain vasorin, which can enhance the migration of human umbilical vein endothelial cells (HUVECs) (64). CD90+ liver cancer cells (known as cancer stem cell-like cells, CSC cells) can release such vasorin -carrying exosomes to increase the production of vascular endothelial growth factor (VEGF), its receptor VEGF-R1, and intercellular cell adhesion molecule-I in HUVECs, thus promoting the adhesion of endothelial cells and the formation of tube-like structures (65). Moreover, long-non-coding RNA (lncRNA) in the exosomes plays a role in the development of liver tumors. CD90+ Huh7-derived exosomes carrying lncRNA H19 might contribute to HCC intrahepatic metastasis and angiogenesis (65). The intracellular transportation of linc-RoR via exosomes can improve the survival of HCC cells under hypoxic conditions (66). In summary, exosomes play a crucial role in liver tumor tumorigenesis, progression, migration, as well as angiogenesis, and contribute to the construction of tumor microenvironment. It may be possible to use particular contents of exosomes as biological markers to predict the diagnosis and prognosis of HCC. The level and type of miRNA in the exosomes found in the serum of HCC patients differ significantly the miRNA in the serum exosomes of normal healthy individuals (67-70). For instance, HCC patients with larger tumors and those with recurrent HCC after liver transplantation had lower levels of miR-718 in serum-derived exosomes. The down-regulation of miR-718 can lead to HOXB8 overexpression, which might be associated with the poor prognosis of these patients (69). Moreover, using a diethylnitrosamine-treated mouse model, Liu et al. found that considering a combination of specific miRNAs changes in the serum and exosomes improved the effectiveness and accuracy of HCC diagnosis in mice, especially at the early stage of cirrhosis (70). Exosomes not only play a specific role in inhibiting hepatic tumor cell proliferation, migration, and invasion; they also affect the treatment response of tumors. 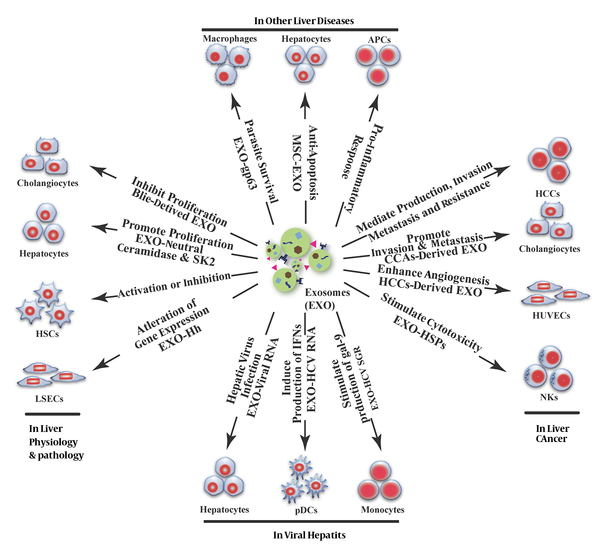 HCC cells treated with anticancer drugs can release exosomes containing HSPs, such as HSP60, HSP70, and HSP90, which can induce the cytotoxic responses of NK cells and the subsequent anti-tumor immune response (71). In the study done by Fonsato et al., human liver stem cell-derived exosomes carrying anti-tumor miRNAs (miR-451 and miR-31) suppressed the growth of HCC in with severe combined immune deficiency (SCID) mice that had been inoculated with primary HCC (72). Human macrophages can also transmit miRNA to HCC cells to inhibit cell proliferation via exosomes (73). Recent research revealed that exosomes containing Vps4A (a tumor suppressor) can reduce the proliferation, metastasis, and invasion of HCC cells (61). In addition, under stress conditions, tumor cells can release exosomes to adapt themselves to the surrounding environment. For example, chemotherapy with sorafenib, camptothecin, and doxorubicin might significantly elevate the level of linc-VLDLR, a long non-coding RNA, in HCC-secreted exosomes, which in turn improves the proliferative activity and drug resistance of the nearby recipient cells (74). However, in a study conducted by Sudarshana et al. after Huh7 cell-derived miR-122-carring exosomes were captured by HepG2 cells, they suppressed cell growth and proliferation, accelerated cells’ senescence, and increased the sensitivity of cells to doxorubicin (75). Similarly, in another study that involved both in vivo and in vitro experiments, the use of exosomes produced by adult mesenchymal stem cells as vehicles to transport miR-122 to HCC cells remarkably enhanced the sensitivity of tumor cells to sorafenib and 5-FU (76). In conclusion, the discovery of exosomes provides a new perspective on the tumorigenesis and progression of liver cancer. With this increase in knowledge, exosome-based technologies can offer both a promising tool for the diagnosis, a prognostic prediction of cancer, and a new strategy for liver cancer treatment. A number of studies have also revealed the involvement of exosomes in liver injury caused by other pathogenic factors. In primary biliary cirrhosis patients, circulating exosomes can regulate the expression of co-stimulatory molecules in antigen presenting cells (APCs), thus contributing to the development of primary biliary cirrhosis (77). Ghosh et al. found that Leishmania donovani-infected host cells (macrophages) could secret exosomes carrying gp63, a Zn2+ dependent metalloprotease. After exosomes were endocytosed by Huh 7 cells, the virulence factor gp63 was released to cleave Dicer1, resulting in a decrease of mature miR-122 in the cells, which led to a decline in the serum cholesterol level and ultimately benefited parasite survival and infection (78). The discovery of exosomes opens up new horizons for information transmission between cells and provides new knowledge regarding the development of disease. More importantly, it offers a promising new direction for disease diagnosis and treatment. In recent years, an increasing number of studies have explored the role of exosomes in liver disease. These studies revealed the involvement of exosomes in various aspects of liver physiology and pathology and in the progress of liver diseases. Moreover, the potential application of exosomes in liver disease diagnosis as well as treatment and prognosis prediction was preliminarily explored. The findings confirmed the undeniable role of exosomes as a new pathway for information exchange in liver diseases. However, despite the considerable progress that related studies have made, research on the relationship between exosomes and liver disease is still in the initial stage. A number of questions remain to be addressed, such as the mechanisms underlying exosome biogenesis, the sorting mechanisms that take place under the specific conditions (e.g., the packing of virus RNAs into exosomes in HBV-infected hepatocytes), exosome secretion, exosome targeting in the extracellular environment, and the role of exosomes in liver tumor occurrence, invasion, angiogenesis, as well as microenvironment construction. In addition, in-depth research should be conducted to expand the clinical application of exosomes and their contents as valuable biomarkers for disease diagnosis and monitoring or as excellent carriers to deliver drugs for targeted therapy in liver diseases. Authors’ Contribution: Gang Chen, Pengyi Guo, and Yi Wang designed the review article. Haitao Yu and Xiaozai Xie drafted the manuscript. Financial Disclosure: The authors have no potential conflicts of interest.